First a recap of 2008’s headline news: It’s been a good year for double-entendres in headlines, as evidenced by samples published in each issue of The Columbia Journalism Review. “Cash reward to be offered whenever a cop is shot,” announced a headline in the March 3 edition of the Newark, New Jersey, Star Ledger. Or “15 pit bulls rescued; 2 arrested” — the White Plains, New York, Journal News, March 6. And while I’ve been thinking globally, I’ve also been trying to act locally. Here are photographs I shot this week to record the natural Zeitgeist of Point Reyes Station during the week between Christmas and New Year’s. Four blacktail deer graze in the early light on Dec. 26 (or Boxing Day, as my relatives in Canada call the day after Christmas). Before long, four wild turkeys showed up in my pasture and proceeded to chase each other in circles. I never could figure out who was chasing whom. As the sun rose higher in the sky on Boxing Day, a buzzard circled several times just off my deck. Here the bird's proximity to the sun results in an unexpected lens flare. Boxing Day by tradition is an occasion for giving gifts to service workers. The sun setting on 2008. Inverness Ridge as seen Monday. Happy New Year, one and all. 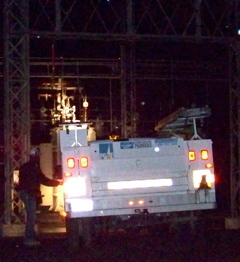 Tomales Bay area residents tonight coped with a several-hour blackout that hit at 7 p.m.
Members of a utility crew show up tonight at the PG&E substation in Olema (right & below). Even after the probable cause of the blackout was found, utility workers still had to systematically test a variety of electrical equipment before turning the power back on. Affected by the blackout were: Olema, Inverness Park, Inverness, Point Reyes Station, and Marshall. Most residents got power back at 10:50 p.m. but a few not until almost midnight. PG&E workers at the substation told this blog they first suspected an animal might have caused a short, but no animal remains were found, and further investigations led them to suspect a regulator had failed. 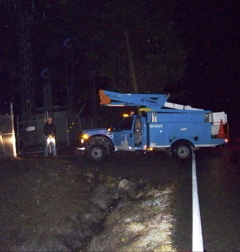 This was hardly the first time there have been problems at the Olema substation. In 2004, a lightning bolt struck a transformer, blacking out roughly the same area as this evening. And back in 1976, the New World Liberation Front bombed the substation. The bomb merely blew a hole in a transformer’s coolant tank, but coolant then drained from it for several hours, causing the transformer to eventually overheat and shut down. It took workers most of a day to get the substation running again, and while this was going on, I happened to wander into Cheda’s Market, which was located where the Whale of a Deli is today. Edna Petroni was working at the checkout counter, and she was thoroughly miffed at these domestic terrorists. Not long after midnight this morning, I was sitting by my woodstove looking into the flames when I heard a coyote howling in the neighboring horse pasture (right), which is owned by the Giacomini family. The howls consisted of wails followed by a series of yips, and the coyote sounded so near I went out on my deck to listen more closely. 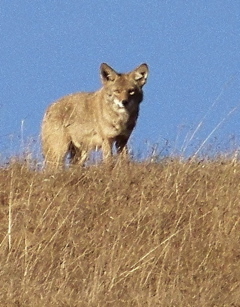 When the coyote howled again, another coyote on the Point Reyes Mesa answered. Before the answering howl ended, however, the first coyote resumed its howling. After a couple more rounds of wails and yipping, the two stopped only to have the silence broken by the distant howl of a third coyote. 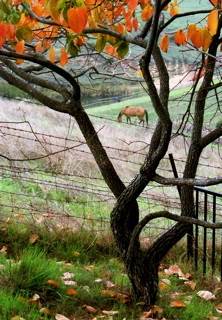 This one sounded as if it were somewhere near the Red Barn, but it was too far away for me to be certain. Nonetheless, the distant howl immediately drew more howling from the first coyote. Soon all three coyotes were howling at once. They finally stopped, but I stayed outside, straining to hear more in the blackness of a moonless midnight. For a minute or two all was quiet, but then a fourth coyote started howling. The howl was so faint I could barely hear it, but it seemed to be coming from the vicinity of West Marin School. Immediately the other three resumed their howling, creating a coyote cacophony on the northern end of Point Reyes Station. I photographed this coyote at the top of my driveway three months ago. Many West Marin residents have heard a coyote chorus at one time or another, and unless they were sheep ranchers, most of them probably enjoyed it. Of course, one can hardly begrudge sheep ranchers their resentment of coyotes. After a 40-year absence, coyotes returned to northern Marin and southern Sonoma counties 25 years ago as a result of the federal government’s ordering ranchers to stop poisoning them. In the years since then, depredation by coyotes has put an end to well over half the sheep ranching here. In my case, however, the howling was a happy reminder that here in the small towns of West Marin, the Old West lives on. The coyotes howl, and the wind blows free. 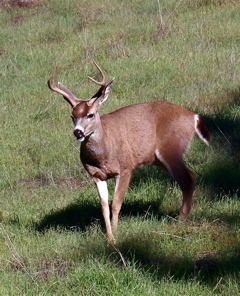 Despite all the coyotes in the area, 12 blacktail deer, including this adult buck which I photographed today, have been spending time in my pasture all week. Relying on badgers to flush field mice and gophers for them! Amazing! Those coyotes really are wiley. An exhibition of plein air paintings by Chileno Valley artist and rancher Sally Gale opened Saturday in the gallery of Toby’s Feed Barn. Showing along with Sally’s exhibit, which is titled Fall Views of Chileno Valley Ranch, are aerial images of Marin County landscapes by photographer Bill Dewey. 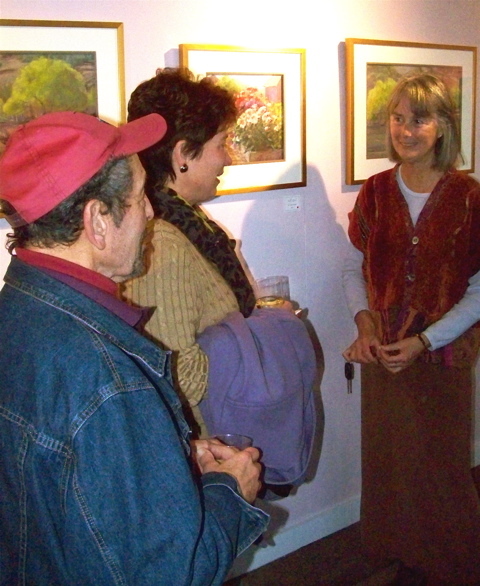 Sally (at right) talks with guests Norman Masonson and Larken Bradley at the opening reception. The painting in the center is titled Sally’s Dahlias. Sally Gale and her husband Mike live in this Victorian ranch house on Chileno Valley Road. 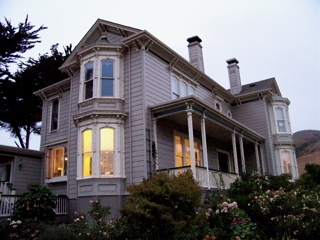 The home, which had long been in Sally’s family, was decrepit to the point of being uninhabitable before Sally and Mike restored it during the 1990s. 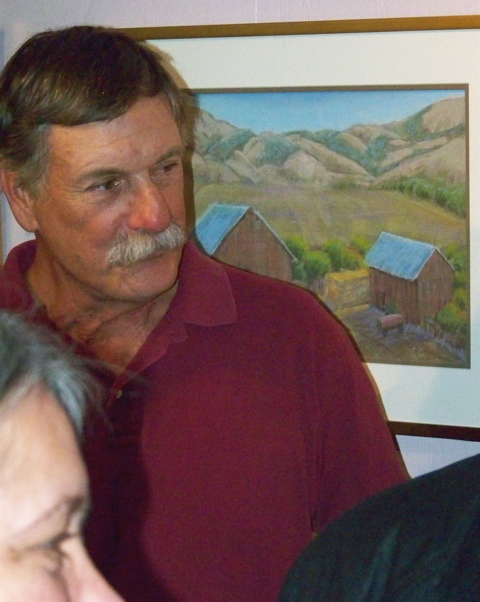 All of Sally’s many works on display were painted in the immediate vicinity of their ranch house, her husband Mike (at center) points out. It’s worth noting, however, that in the immediate vicinity of the house are barns and other ranch buildings, along with corrals, pastures, orchards, a flower garden, stands of cypress trees, and a creek. The Gales sell grass-fed (as opposed to feedlot) beef directly to families; there are no middlemen involved. On 600 acres, they graze approximately 100 cows with their calves, as well as raise sheep and poultry. They also grow a variety of organic apples. 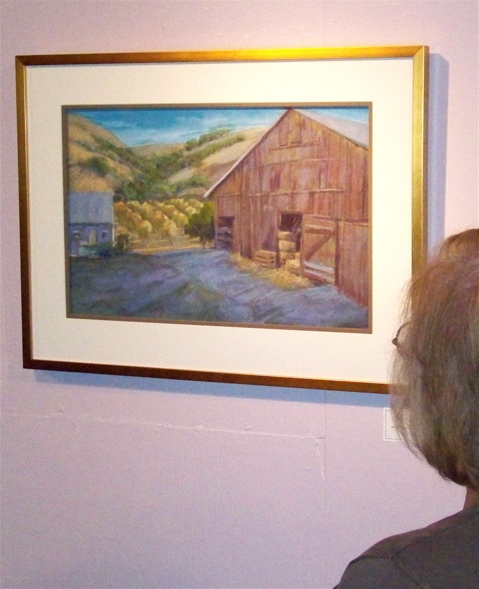 Here Karen Ward, a guest at the opening reception, admires a painting of the Gales’ barn. 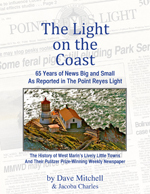 The exhibition will continue at the galley in Point Reyes Station until Dec. 31. I was preparing to fix breakfast about 11 a.m. today when I looked out the kitchen window and saw a bobcat hunting just outside. Two weeks ago, as was reported here, I had been thrilled to see and photograph a bobcat hunting near a car parked at my house. 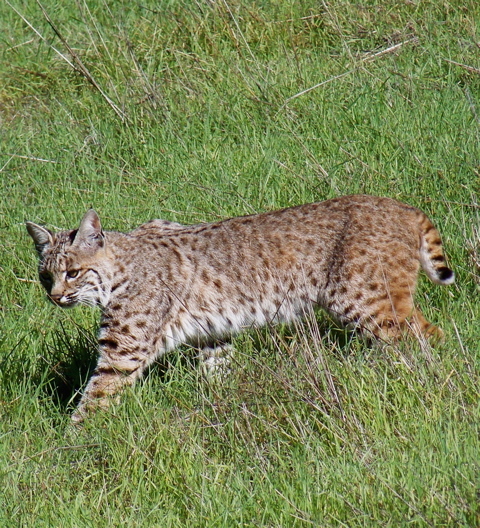 This time, the bobcat was even closer. To photograph it, I slid open the kitchen window as quietly as I could, freezing motionless whenever the bobcat heard a noise and looked up. The cat was hunting gophers, and I while I watched, it pounced and caught one. 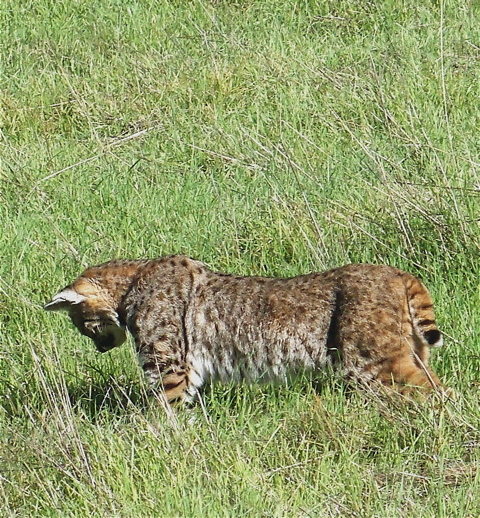 With the gopher dangling from its mouth, the bobcat then ran uphill to eat its meal under a clump of coyote brush. Later today, I twice again spotted the bobcat nearby. Three or four mornings ago, I had likewise looked out a kitchen window and spotted a mottled cat (at left) with a bobbed tail hunting near my woodpile. Before I got too excited, however, I used my binoculars to inspect it more thoroughly. Rats! It was just a big housecat with a bobbed tail. 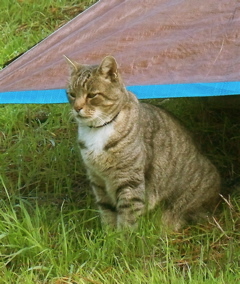 Soon the cat walked over to my woodpile and sat at the edge of the tarpaulin that covers it. 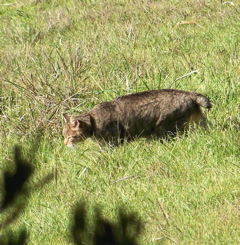 While all this was going on, I took a couple of photos just to illustrate the difference between a real bobcat, Lynx rufus californicus, and a faux bobcat, Felis catus. 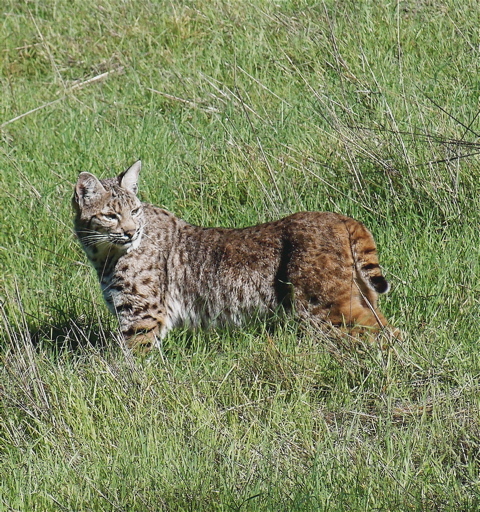 As can be seen in the photos, the easiest way to tell them apart is that real bobcats don’t wear pet collars. Sparsely Sage and Timely is powered by	WordPress 4.9.10 and delivered to you in 0.370 seconds using 42 queries.